Right now in most areas of the country inventory is low and buyers are fiercely competing for houses.Â In the Greater Phoenix area this is happening like never before! Why is housing inventory so low?Â In late 2006 we had over 400 active home builders here in the valley.Â By late 2008 that number was under 20.Â Builders not only didnâ€™t build much for about 5 years â€“ they still arenâ€™t.Â Yes, building permits are â€œway upâ€ but not up enough to actually take care of the increasing population of Maricopa County.Â Not even close. We have fewer houses for sale and prices are rising.Â It is common to have multiple offers on any desirable home.Â For those buyers saying â€œI wonâ€™t get involved in a bidding warâ€ we need to point out that they may need to re-think their strategy.Â To avoid a bidding war a few things need to happen – builders need to be fully building (creating more supply, which will take years) and prices need to go up enough to dampen demand.Â Or you can prepare for the fight and buy at prices that still are a bargain by most any yardstick. Yes, Virginia. The Market is UP! As 2013 approaches the halfway mark, the local market trends continue to strengthen their path.Â As agents, we continue to be amazed at what a strong real estate recovery is underway in the valley.Â But, as always, there is what the market is doing and then what people think the market is doing.Â Public sentiment remains mixed despite the (to us) obvious recovery.Â So perhaps human reaction is ultimately more interesting than any real estate market will ever be!Â Nonetheless, letâ€™s look again at the numbers comparing now with the same time last year. Active Listings: 20,670 versus 21,841 last year – down 5.4%. Pending Listings: 10,658 versus 11,964 last year – down 10.9%. Monthly Sales: 8,162 versus 8,187 last year – down 7.4%. Monthly Average Sales Price per Sq. Ft.: $113.10 versus $93.57 last year – up 21%. Monthly Median Sales Price: $167,000 versus $130,000 last year – up 28.5%. What does this mean?Â New listings to the market, are down.Â Sales are down from last year, but this is directly connected to the constricted supply rather than low demand.Â There are simply more buyers than there are homes for sale.Â This connects to the rising prices which are heading up again due to the unsatisfied demand (although not at the same pace of last spring). Of great interest is the mix of what is selling.Â While single family sales are down as are condo/townhome sales, in contrast mobile home sales are up 7%.Â Why?Â Mainly because the mobile homes new to the market are up 17% over last yearâ€™s first quarter.Â This demonstrates the effect supply has on sales. Distressed supply continues to disappear. The number of active REO (Bank Owned) listings across Greater Phoenix is down 18% in just the last month and is now down 93% from the peak in January 2009. Short sales are down 12% in the last month and are also down 93% from their peak in May 2010.Â In fact, normal sales are back around a 73% market share (the highest amount since February 2008) and short sales at 16% and REOs at 11% (their lowest share since December 2007). Of course the facts are very clear, but 80% of the public have not yet accepted those facts. The housing crisis actually started in 2006 but the public did not really notice until 2008. 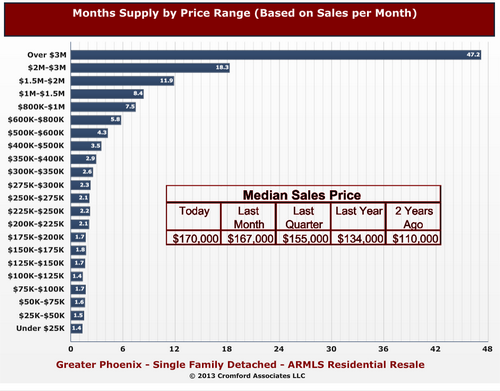 By April 2009 homes in the City ofPhoenixhad pretty much lost all the value they were going to lose. From reputable analysis sources we can see that most (but not all) parts of the country were well into recovery during 2012. The majority of the general public will probably not really acknowledge the recovery until 2014 or maybe even 2015. Unfortunately, this mental mindset is sidelining sellers who want to sell but are not certain they can. How do you know if you have equity again and can sell?Â Short of an appraisal or a market analysis by your agent, there is a rule of thumb that works in the majority of the cases.Â If you bought your home before January of 2004 or after September 2008 (or bought a foreclosure) â€“ you probably now have equity. These factors are combining to create a housing shortage for this year.Â Net migration is up and the builders simply are not building enough volume to meet demand.Â In the short term, it would appear sellers have plenty to smile about and buyers are likely to feel some frustration in their efforts to buy. As always, we remain committed to keeping you informed and helping you through this ever changing market.Â As always, we tip our hat to the wonderful Michael Orr of the Cromford report for his accurate market statistics.